Friday morning, I made a second pass through the breakfast buffet while Dave mapped out his must-see list for our visit to the Prado museum. Polishing off a croissant, I skimmed a short history of our hotel—The Westin Palace, Madrid. 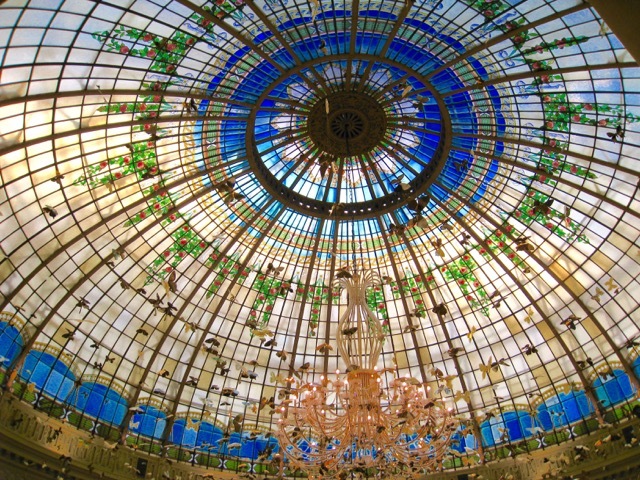 The building was commissioned by King Alfonso XIII in 1912 and has an enormous stained glass dome that tops the regal structure. However, the hotel entrance was an understatement in comparison to the grandeur of the interior with its sweeping marble floors and ornate staircases. Dave’s sudden declaration that he had completed his Prado list broke into my idle musings. He ushered me through the lobby and out the front doors for the Museo Nacional del Prado. The current collection has around 7,600 paintings, 1,000 sculptures, 4,800 prints, and 8,200 drawings. We definitely had a lot to see. The warm, morning sun felt good as we strolled to the corner and crossed the street to the museum, a mere five-minute walk from our hotel. Tickets in hand, we queued up, ready to go through security. From behind us, someone called out, “Hey, you two.” We turned to see the British couple we had met in Toledo, the day the four of us got lost trying to reach the railway station. We cleared security, exchanged a few pleasantries, and went our separate ways. For hours, we traipsed through what is unquestionably the largest and finest collection of European art. But in the third hour, I left Dave with El Greco, de Goya, and Titian and went in search of Diego Velázquez’s Las Meninas (1656). Like many who know the painting, I had been charmed by a child I had never met, as was Velázquez, the court painter commissioned to paint Margarita Theresa, the privileged daughter of Philip IV and Mariana of Austria. Always the center of attention, Margarita was destined, one day, to be an empress. In several of Velázquez’s paintings, she appears to revel in her appearance; the rich brocade gowns and elaborate hairdos were all mandatory fashion for any grand lady. As a child of the Spanish Habsburgs, she was betrothed to her maternal uncle and paternal cousin, Leopold I, Holy Roman Emperor. It was required that she maintain her succession to the Spanish throne and that her succession rights pass to her descendants. In 1665, the fifteen-year-old Margarita left Spain for Austria and was married in Vienna in 1666. Despite the couple’s eleven-year age difference, she and Leopold were supposedly very happy together, sharing a love of music and theater. Tragically, at the age of just twenty-one, Margarita Theresa died, debilitated after giving birth to four children and enduring many miscarriages. She is buried in the Imperial Crypt in Vienna. Her only surviving child, Archduchess Maria Antonia of Austria, gave birth to three children, all of whom died in childhood. Maria herself died at age twenty-three. The Habsburgs were one of the most powerful dynasties of Medieval and Renaissance Europe, reigning over huge territories from the mountains in Switzerland to swaths of Austria, Hungary, Italy, France, and Spain, even controlling land from the Philippines to the Americas. But they maintained sovereignty by rarely marrying outside the dynasty. From 1516 to 1700, an estimated 80 percent of the marriages were consanguineous, or between close blood relatives. Most often, these unions were between first cousins, double first cousins, and uncles and nieces. As a direct result of this inbreeding, infant and child mortality rose 50 percent among the Spanish Habsburgs. In 1700, an entire dynasty of kings came to an end when Charles II of Spain died from a panoply of health defects. Physically disabled, mentally challenged, and disfigured, he died senile and plagued with epileptic seizures. He had two wives but no offspring. Of the thirty-four children born to the Spanish Habsburgs, half died before their tenth birthday and ten died before their first, most likely the result of generations of inbreeding. Could the same marital practices that built a powerful dynasty have also caused its demise? Dwelling on this sad conclusion, I sought out the works of Hieronymus Bosch, who produced at least sixteen triptychs, of which eight are still fully intact. The Last Judgment, created after 1482, currently resides at the Academy of Fine Arts in Vienna, Austria. Having seen this triptych on a prior European visit, I was interested in viewing more of Bosch’s work. In the late sixteenth century, Philip II of Spain acquired many of Bosch’s paintings, so the Prado owns The Adoration of the Magi, The Garden of Earthly Delights, the tabletop painting of The Seven Deadly Sins and the Four Last Things, The Haywain Triptych, and The Stone Operation. Although Bosch signed several of his pieces, he dated very few. The Haywain Triptych dates back to around 1516, the date established by means of dendrochronological research. The Garden of Earthly Delights, dated between 1490 and 1510, is his best-known and most ambitious complete work. It has been housed in the Museo Nacional del Prado since 1939. But the four last things appeared to be pretty straightforward. “Death of a Sinner” shows a dying man receiving the last rites from a priest. In “Glory,” the saved enter heaven. In “Judgment,” angels are waking the dead, while Christ is shown in glory. Finally, in “Hell,” demons torment the sinners. What bothered me most about this work was not its subject but knowing that recent dendrochronological dating had revived the controversy that the painting was done by a student of Bosch, not Bosch himself. I checked the time. I had agreed to meet Dave near another of my favorite artists, Albrecht Dürer. I fell in love with his work the first time I laid eyes on his self-portrait in the Louvre, Paris. Nearing the end of the fourth hour, my mind began to wander to things other than art, such as whether the Prado would be a good setting for a scene in a future Darcy McClain thriller. My imagination was running wild when Dave tapped me on the shoulder. I said goodbye to Dürer and accepted Dave’s suggestion of some shopping. I had just the place in mind—Lola Fonseca. Lola’s small retail shop/workshop offers a variety of hand-painted silk scarves, foulards, shawls, and beautiful fans. We entered the store to find Lola at work hand-painting a turquoise silk scarf, her dog Lana sprawled on the floor. With Lola being friendly and not pressuring me to buy, I perused the scarves for a good twenty minutes before making my purchases. It was a tough decision with so many wonderful colors and designs to choose from. After this brief shopping spree, we took a leisurely walk to Parque del Buen Retiro (Park of the Pleasant Retreat)—or simply El Retiro, as the locals refer to it. 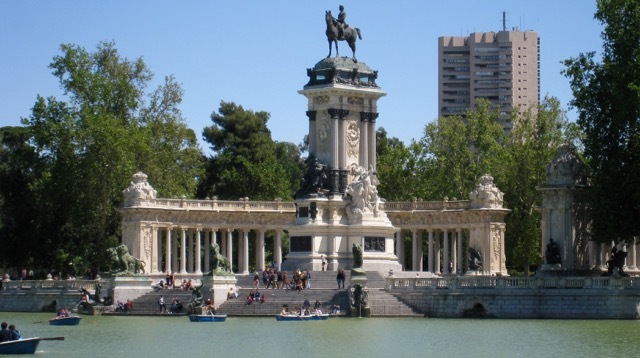 The park is one of the largest in Madrid and belonged to the Spanish monarchy until it opened to the public. 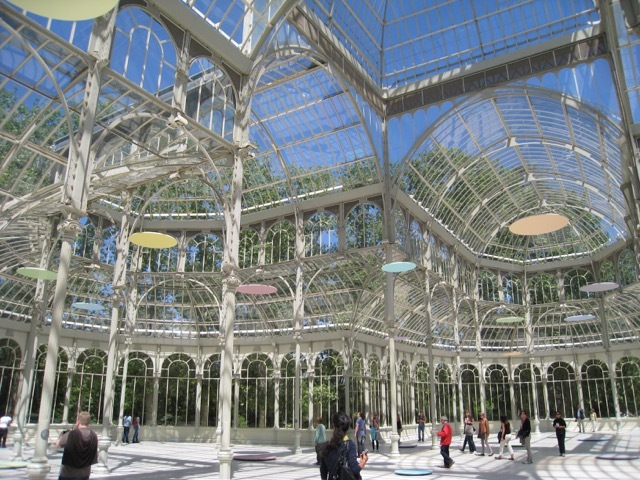 We paused at the boating lake to snap photos of a few rowers enjoying the warm day and carried on to what I really wanted to see—Palacio de Cristal. 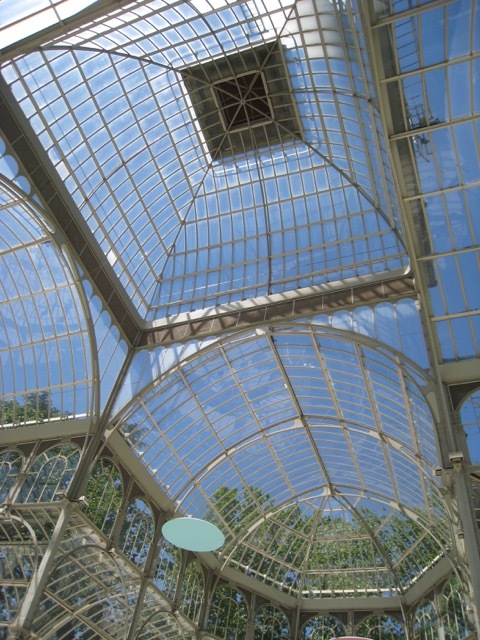 The palace, modeled on London’s Crystal Palace, was designed by architect Ricardo Velásquez Bosco and made almost entirely of glass set in an iron framework on a stone base. It was built in 1887 to house exotic flora and fauna as part of an exhibition on the Philippines, which was still a Spanish colony. Today it is used for contemporary art exhibitions. Not far from the park, we spotted people sitting at tables under a grove of trees. 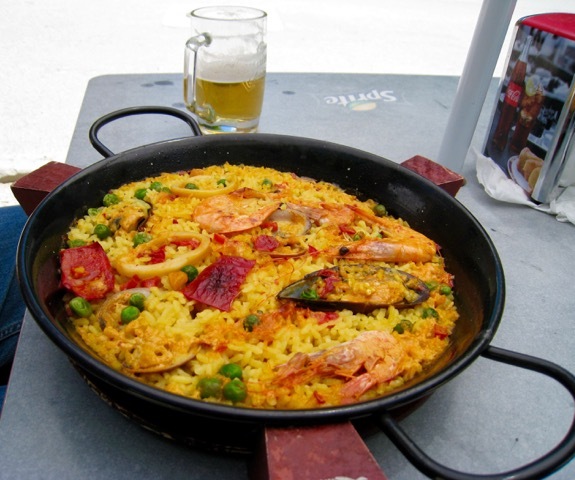 As we drew closer, we noticed they were eating paella. We ordered one to share, as well as one icy cold beer. We didn’t want to spoil our appetites for dinner by eating too much that late in the day. El Barrill de las Letras, a recommendation from our hotel concierge, was a good dinner choice. We started with clams on the half shell, followed by grilled octopus, grilled asparagus, and an order of sole “roasted in its skin.” To wash down our delicious seafood, we chose a good Spanish white wine. Full, we walked off the meal with a short stroll, then retired to our room to pack, for the next day we were flying back to the US. Next week, I am taking a short break from blogging before I begin a new series of posts on October 22nd. These will focus on book and writing-related topics, as well as comment on and answer questions from my readers and blog subscribers. This entry was posted in Spain, Travel and tagged Author Pat Krapf, Best new thriller, best new thriller novel, bestselling thrillers, Madrid, Madrid Spain, Pat Krapf Author, Prado, Prado Museum, Spain on October 8, 2015 by Pat Krapf.